PRIVATE CLARENCE HOWELL 30582, 9th Battalion, Worcestershire Regiment Died aged 21 on 25 January 1917 Remembered with honour on Basra Memorial, Iraq;* Panel 18 & 63. Commemorated in Tewkesbury at the Cross and in the Abbey. * In 2014 the CGWC advises that it is not possible to visit Memorials in Iraq; instead Rolls of Honour can be seen in London: "The Rolls of Honour held at the Commission’s Head Office commemorate by name all the Commonwealth casualties who died in Iraq during the two World Wars". Private Howell is featured in the THS World War I book, A Noble Band of Heroes. Obtaining extra information from families has proved difficult after 100 years. However, in working with the Howell family who had emigrated to Canada in 1921, two more photographs of their deceased relative, Clarence have emerged. 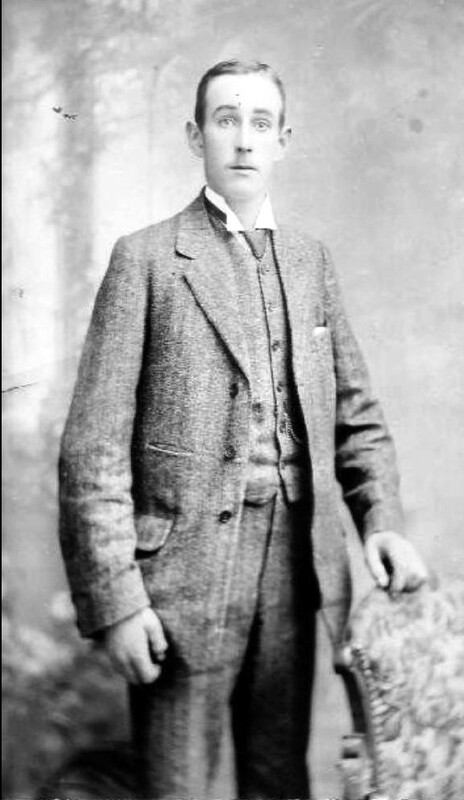 When the book was published we only had a photograph of the child but the family has provided photographs of Clarence as a young man about town and as a recruit to the army. Such family help in an invaluable aid to successful historical research. For this progress we are indebted to Barbara Jones of Ontario, Clarence’s great niece. CLARENCE HOWELL was born in Tewkesbury in the summer of 1895 to Thomas Howell and Clara Alice (formerly Bruce). Thomas came from Tewkesbury whilst Clara was born in London; all ten of their children were still alive in 1911. 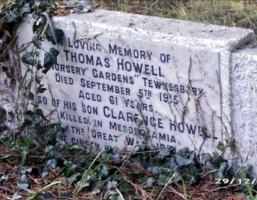 Thomas Howell was a landscape gardener, operating a two-acre nursery garden behind the present Graham Court Residence in Oldbury Road (the area is now occupied by housing). Clarence was a pupil at Holy Trinity School and later worked for Mr. North, the printer. In 1911 Thomas and Clara were living in Oldbury Road with eight of their children including Clarence, whose occupation at that time was given as a paper seller for a newsagent. Thomas died in Tewkesbury in 1915 at the age of 61. Clarence enlisted in Bristol in April 1916 in the Worcestershire Regiment, almost certainly as a conscript. Initially he was probably posted to the 5th (Reserve) Battalion for training purposes and then transferred to the 9th (Service) Battalion for active service. 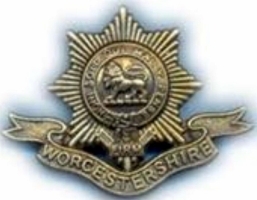 This battalion had been formed at Worcester in August 1914 as part of Kitchener’s Army, coming under the command of the 39th Infantry Brigade in the 13th (Western) Division. The division fought in Gallipoli in 1915 against Turkey, one of Germany’s allies. At the end of the campaign in early 1916, the division was successfully evacuated from the peninsula, sailing to Egypt where it held defences on the Suez Canal for a short time. 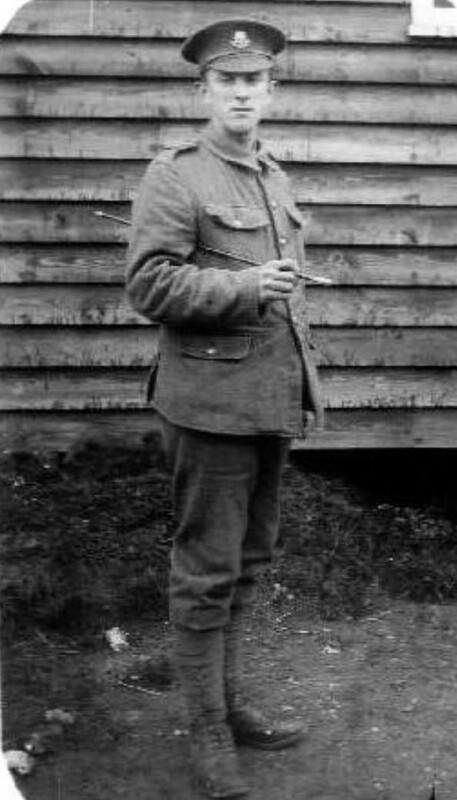 Private Clarence Howell was reported as killed in action on 25 January 1917, the day on which his battalion launched an attack, known as the Capture of the Hai Salient (25 January-5 February 1917). His body was not recovered nor identified and he is commemorated instead on the Basra Memorial. * A War Gratuity of £3 was awarded to his mother in November 1919. His death is also commemorated on a family memorial in Tewkesbury Cemetery. Following the death in 1915 of her husband, Thomas Howell, it is clear that Clara was struggling to keep the nursery gardens in business. An unsuccessful attempt was made to sell them in 1920-21 and they were eventually sold for housing. Clara consequently emigrated to Canada to live with a son and daughter.